On 7 February 2019, UNESCO Tashkent launches a portal for Massive Open Online Courses (MOOC). MOOCs are gaining popularity all over the world because of its accessibility and flexibility – they can be taken by anyone, anywhere in the world and, moreover, the courses can be taken at the own convenience and pace of students/ listeners. This quality of MOOC fully complies with the principles of UNESCO in the field of education, namely, it makes education open and free. MOOC turned out to be a kind of avant-garde of liberalization of modern education. Many courses use interactive tools, which makes them attractive and comprehensive to students and expand their understanding of traditional teaching tools. To date, MOOC has overcome geographical barriers, but language barriers still remain - so there are no online courses in the Internet that provide knowledge in Uzbek language - all existing MOOCs are mostly available in international languages, including English. This portal intends to fill this gap and place the courses in Uzbek, as well as in Russian, Karakalpak and English. Therefore, all interested universities of Uzbekistan are welcomed to take an active part in development and placement of their courses on this educational portal. Currently, the MOOC portal has two open courses on journalism “Media and Information Literacy in Journalism” and “Safety of Journalists’ Professional Activities.” During the launch event, there will be opening speeches from UNESCO and UK Embassy in Tashkent and short presentations of technical capacity of the MOOC portal by TUIT staff and content of two courses by developers and instructors of the courses. The project “Enhancing the Capacity of Uzbek Media to Serve the Public Interest” was launched in June 2018 and focuses on enhancing capacity of Uzbek media sector to produce more objective, impartial, accurate and inclusive high quality media content, including increased awareness of the roles and responsibilities of the media. The project is implemented in cooperation with BBC Media Action who deliver several trainings and workshops on non-news programming, mobile journalism, current affairs programs, etc. for journalists of NTRC and NAEMM. UNESCO works on promoting Media and Information Literacy (MIL) through massive open online course and practical handbook on MIL for pre-service and in-service journalists. 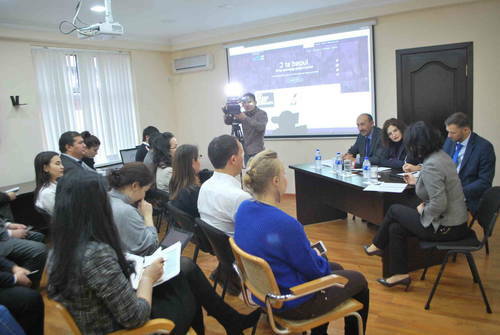 The project “Safety of Journalists and Countering Impunity in the Media of Uzbekistan” was launched in August 2018 and focuses on the implementation of two recently amended laws “On Mass Media” and “On the Safety of Journalists' Professional Activities” through strengthening the capacity of stakeholders on this issue. The project works with journalists and legislative / law enforcement bodies to facilitate effective resolution of cases involving accusations against journalists. Better collaboration between mass media and legislative/ law-enforcement bodies in investigations and implementation of rule of law will serve as specific protection mechanism and create safe working environment for journalists. It is important to note that the project’s activities are in line with the goals and priorities identified in the Roadmap for Further Development of Cooperation between the UN and Uzbekistan for 2017–2020, which was approved and signed by the Government of Uzbekistan, as well as the Action Plan signed between Uzbekistan and UNESCO for 2018- 2021 years.